To represent a fixed value set in ABAP you can use several different technologies. The newest one is enumerations which are provided at language level and can be used as of AS ABAP 7.51. With this blog post I want to show which possibilities there are for ABAP developers to define enumerations and use them in signature elements in the safest way possible. Enumerations enable you to define a fixed amount of named values for a specific context within the type system of a programming language. These behave like constants but have the additional feature of being limited to the defined values (and not to the type of the constant). This is especially useful when defining formal parameters using enumerations, because then the user of your API is less likely to use your method wrong (because the type system does not allow it, it would be a compile time error). "! @parameter iv_on | Should they be on? switch IMPORTING iv_on TYPE abap_bool. 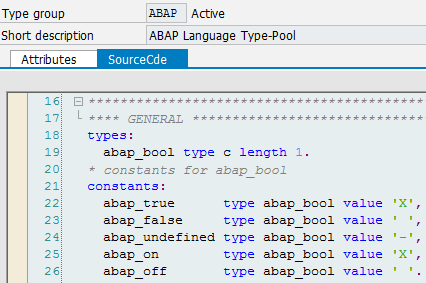 However, the type system does not force you to use ' ' or 'X' because abap_bool is just a type definition in the global type-pool abap and its actual type is C with a length of 1. It will however probably lead to an error in the implementation of the method because the programmer who implemented it does not expect someone to use ‘A’ as the actual parameter because by convention only ' ' and 'X' should be used. For abap_bool this is probably fine because most developers know about abap’s missing in-build boolean type and the ways around it. But what about other types that are module / application specific or that you define on your own? Let’s say we have more states than just true and false. Our lamp is not just on or off now but can display different colors (like traffic lights). gc_red_and_yellow TYPE gty_light_state VALUE 3. 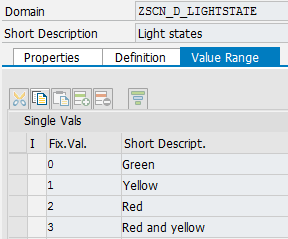 TYPES: lty_i_range TYPE RANGE OF zif_light_states=>gty_light_state. As you can see the user of the API is pointed to the constants interface in the method documentation and by the type of the importing parameter. The type declaration of gty_light_state in the interface would normally be unnecessary (because the inbuilt type I of course already exists) but it helps to reference the place where the constants are stored. You could of course also create a DDIC data element and refer to the interface in its description. But if it is not documented somewhere, the API user is forced to look into the implementation of the method to find out what actual parameters to use (which is troublesome and not always possible, think of defining your method in an interface without implementation). So now the possible values are known, but still, as the developer implementing the method (and using design by contract principle) you should validate the actual parameters of the caller. Which means checking if it is one of the constants. In the example above this is done using a range table. You can see another weak point here. If one decides to add another state to our traffic lights (like blinking yellow) the validation logic would have to be updated even if the rest of the method could handle an additional state just fine. One advantage or disadvantage of using interfaces for constant definitions is that you can implement the interface in the class that uses them. This enables you to access the constants directly (as long as you defined aliases). On the other hand you will also find everything the interface defines in the debugger if you inspect an object instance in the members view. I am personally not a fan of doing that. Another way is using domains in the data dictionary. These seem particularly well suited for this task at first. However, one thing to keep in mind is that there is no way to refer to each of the values in a static way (as they have to be fetched from the database first). That sometimes leads to a situation where you have a domain and constants you have to keep in sync. For example in a CASE statement. An advantage is though, that you can use traditional dynpro value helps / you get them “for free” with localization support (and also domain appends). Since AS ABAP 7.51 there is a construct available at language level for exactly the use case described here. The implementation chosen by SAP (to my surprise) is “value type based” and not object oriented as in many other languages (like Java or C#). In short: by defining an enumeration you define a type (value type to be exact) and associated constants for it, that implicitely get values assigned if you don’t do it yourself. Additionally any assignment to data objects that are typed as an enumeration type will get compile time checks if the associated constants are used or not. If not it results in a syntax error. switch_light IMPORTING ie_new_state TYPE gte_light_state. In my opinion these should replace the interface constants in all use cases, as long as you don’t have to worry about backwards compatibility. I think it makes sense in ABAP to not have enumerations implemented as classes because of the lack of inner classes (local classes are not statically accessable outside of the class). So you would have to create a global class for any small enumeration, which, if you do it consistently, quickly assumes alarming proportions like the SALV library has with constant interfaces. However in other cases you might want to bundle some functionality with your enumeration instead of just providing the fixed values. Let’s see how you can do that. In ABAP we unfortunately do not have enumeration classes. We can however implement them “manually” effectively skipping the step the Java compiler does automatically. go_red_and_yellow TYPE REF TO zcl_light_state READ-ONLY. CREATE OBJECT: go_green, go_yellow, go_red, go_red_and_yellow. As you can see just like in the Java enumeration we have static reference variables for each of the enumeration values. These cannot be changed from the outside (because they are READ-ONLY and effectively final). They are loaded on first use of the class using the class constructor and refer to instances of the class itself. It is not possible to create any other instances of the class because the constructor is private (CREATE PRIVATE) and the class is also final (so no publicly creatable subclasses). This means there can only ever be these 4 instances of the class available (*). You can now use the enumeration class similarly to the constants interface but except for comparing constant values now memory addresses will be compared. get_current_state RETURNING VALUE(ro_state) TYPE REF TO zcl_light_state. mo_light TYPE REF TO zcl_light_state. IF io_new_state IS NOT BOUND. Because the parameter is now an object reference to an instance of a class where there can only ever be the instances created which are defined in itself, the only illegal parameter value is null, which you should probably check for. Compared to a constants interface or a domain or even 7.51 enumerations you might say this is much more effort. And it is. However, the advantages are that you let the type system check values of parameters at compile time (except null) and you have a full on ABAP objects class, in which you can bundle related functionality to the enumeration, like serialization, additional attributes etc. Here is a more advanced example. get_next RETURNING VALUE(ro_next) TYPE REF TO zcl_light_state. "! @parameter iv_name | Name of the light state, must be unique! constructor IMPORTING iv_name TYPE csequence. gt_registry TYPE STANDARD TABLE OF REF TO zcl_light_state. &1 = NEW #( &2 ). INSERT &1 INTO TABLE gt_registry. ro_light_state = gt_registry[ table_line->mv_name = iv_name ]. WHEN go_red_and_yellow THEN go_green ). lo_light_switcher->switch( lo_light_switcher->get_current_state( )->get_next( ) ). In standard SAP these classes are for example used in the ABAP workbench. If you look in the related development packages you can find classes prefixed with CE (E for enumeration I assume) that are built and used in exactly this way. In fact the workbench is a very good example for enumeration classes because they are ideally used in technical developments because persisting them to the database requires extra steps (they need to be serialized to a constant value again) and for classic user interfaces there will be no generated value help dialogs. If you look further in the repository infosystem with CL*ENUM* you can find lots of other examples. There are even abstract base classes for enumerations you might want to take a look at (for example CL_BCFG_ENUM_BASE). So of course I thought “How can I have the advantages of both technologies, language level value type based enumerations with compile time checks and no nullpointers and also enumeration classes with utility methods and additional attributes?”. So here’s a try at that, though I am not too happy with the following implementation. I don’t see a way to connect the enumeration constant with the enumeration class instance (“companion object”) without using a static accessor method. RETURNING VALUE(ro_light_state) TYPE REF TO zcl_light_state. gt_registry TYPE SORTED TABLE OF gty_registry WITH UNIQUE KEY enum. NEW #( iv_name = &1 ie_enum = &2 ). ro_light_state = gt_registry[ enum = ie_enum ]. CATCH cx_sy_itab_line_not_found INTO DATA(lx_ex) ##NEEDED. INSERT VALUE #( instance = me enum = ie_enum ) INTO TABLE gt_registry. *2 In the documentation‘s last chapter under notes you can find information on illegal values being passed to enumeration data objects. According to it other values than the enumeration values and the initial value of the base type can be assigned (allowed by the compiler) to enumeration data objects using dynpros and should therefore never be used with classic dynpros (disallowed by programming guideline). Thanks a lot for summing up the various enum techniques. An excellent overview with a good introduction. I also like that you tried to bring both worlds (7.51 enum feature and OO-enum) together. You made me also aware, that I should check if my OO enums are bound. I gonna forward your blog to my colleagues.